Long and curved with rough jagged edges, these delicious Chocolate Hazelnut Biscotti are dotted with chunks of toasted hazelnuts. They have a deep chocolate flavor that comes from adding both unsweetened cocoa powder and semi-sweet chocolate to the batter. I love how these biscotti will stay fresh for weeks, which makes them the perfect Christmas cookie. I am often surprised at how the chocolate flavor of these biscotti can vary simply by the changing the brand of semi sweet chocolate and unsweetened cocoa powder. What is a little unusual is that the semi sweet chocolate is not melted or left in chunks to be folded into the batter as you would chocolate chips. Instead it is put into a food processor, along with the brown sugar, and processed until finely ground. This recipe uses unsweetened natural cocoa powder, not to be confused with Dutch-processed, which has a milder flavor. Unsweetened cocoa powder is quite bitter tasting which adds a deep chocolate flavor to baked goods. Keep in mind that it is acidic so that is why it is used in recipes calling for baking soda (an alkali). Popular brands of unsweetened cocoa powder are Hershey's, Ghirardelli, and Scharffen Berger. This biscotti is loaded with chunks of hazelnuts. If you buy raw hazelnuts that are still covered with their dark brown, bitter, papery skin, this does need to be removed. This is done by toasting the nuts. Toasting the nuts not only removes the bitter skins but also enhances the sweet, rich, buttery flavor of the nut. Place the hazelnuts on a baking sheet and bake in a 350 degree F (180 degree C) oven for 15 minutes or until brown and fragrant and the skins begin to flake (peel). Remove from oven and cover the hot nuts with a dish towel and let them sit (steam) for about five minutes. Then rub the nuts in the towel briskly to remove the skins. Let cool before chopping coarsely. Chocolate Hazelnut Biscotti have a really nice crisp and crunchy texture which, of course, makes them perfect for dunking in our coffee. You can vary how crunchy these cookies are by how long you leave them in the oven during the second baking. If you like them really dry and crunchy bake them the full amount of time stated in the recipe. However, for a softer biscotti, reduce the second baking by about five minutes on each side. These biscotti look and taste especially good when you dip the ends of each biscotti in melted white chocolate. 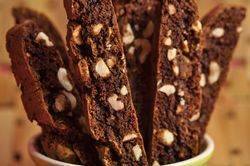 Chocolate Hazelnut Biscotti: Preheat oven to 350 degrees F (177 degrees C). To toast hazelnuts: spread on a baking sheet and bake for about 15 minutes or until lightly browned and fragrant, and the skins start to blister and peel. Remove from oven and cover the nuts with a clean dish towel. Let the nuts 'steam' for 5 minutes and then briskly rub the towel (with nuts inside) to remove the skins from the nuts. Cool and then chop coarsely. Reduce the oven temperature to 300 degree F (150 degrees C). Line a large baking sheet with parchment paper. With floured hands divide the dough in half. On a lightly floured surface roll each half of dough into a log shape about 10 inches (25 cm) long and 2 inches (5 cm) wide. Transfer the logs to the prepared baking sheet, spacing about 3 inches (7.5 cm) apart. Bake until almost firm to the touch, about 35 - 40 minutes (logs will spread during baking). Remove from the oven, place on wire rack, and let cool for 10 minutes. Using a long spatula transfer the logs to a cutting board. Using a serrated or sharp knife cut the dough into slices 3/4 inch (2 cm) thick on the diagonal. Arrange the slices cut-side down on the baking sheet. Bake 15 minutes. Turn the slices over and bake until crisp and dry, about 15 minutes. Remove from oven and let cool on wire rack. These are wonderful with a white chocolate glaze: Melt 3 ounces (90 grams) of chopped white chocolate in a small metal bowl placed over a saucepan of simmering water. Dip one end of the biscotti into the chocolate and let it dry, on a parchment-lined baking sheet. Store in an airtight container for several weeks. Williams-Sonoma Kitchen Library. Cookies & Biscotti. Weldon Owen Inc. San Francisco: 1993.